Brad Loyet with his micro-sprint race car at Greenscape Gardens. Bradley won first place that evening at Tri-City Speedway in Granite City, Ill. Bradley was undefeated in Tri City in 2004 with three wins. Bradley's season consisted of 12 first place wins and is now racing in USAC. The Outlaws better watch out, SPEEDRACER IS ON THEIR HEELS. Brad is heading to the Tulsa Chili Bowl next weekend. 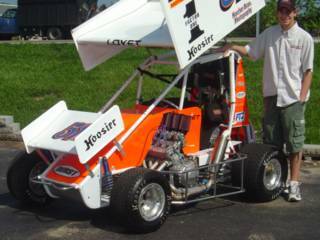 Good luck to the Loyet Motorsports Team, Joe & Brad Loyet. Check out www.bradloyet.com for additional stats.